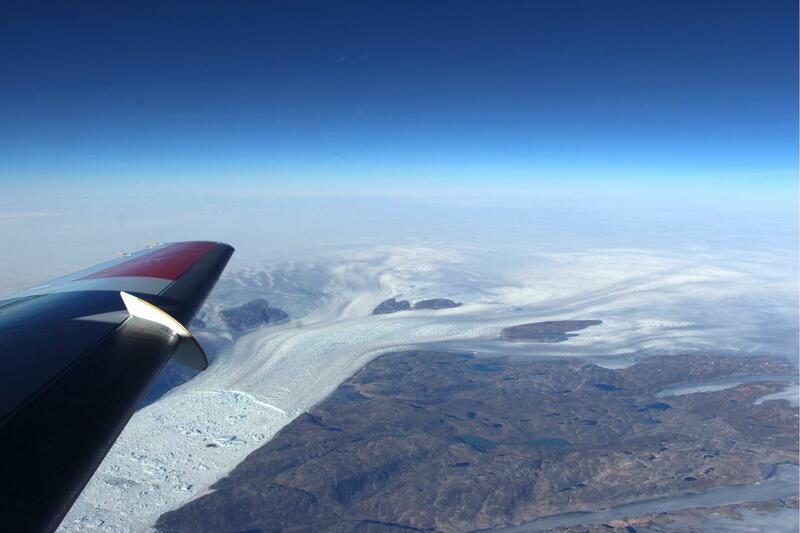 Operation IceBridge, NASA's airborne survey of polar ice, is flying in Greenland for the second time this year, to observe the impact of the summer melt season on the ice sheet. The IceBridge flights, which began on August 27 and will continue until September 16, are mostly repeats of lines that the team flew in early May, so that scientists can observe changes in ice elevation between the spring and late summer. "Earlier in IceBridge's history, we only surveyed the elevation of these glaciers once a year," said Joe MacGregor, IceBridge's deputy project scientist and a glaciologist with NASA's Goddard Space Flight Center in Greenbelt, Maryland. "But these glaciers experience the climate year-round. Now we're starting to complete the picture of what happens to them as the year goes on, especially after most of the summer melting has already occurred, so we can measure their cumulative response to that melt." The image above, taken during a high-priority flight that IceBridge carried on Aug. 29, shows Helheim Glacier, with its characteristic wishbone-shaped channels, as seen from about 20,000 feet in the sky. Helheim is one of Greenland's largest and fastest-melting glaciers. During the first week of the summer land ice campaign, IceBridge has also flown over glaciers along Greenland's northwest, southeast and southwest coasts, and also over lines that the Ice, Cloud, and land Elevation Satellite (ICESat) flew over Greenland during its 2003-2009 period of operations, to observe how ice elevation has evolved since then. Future flights will cover critical areas in central and southern Greenland, such as the world's fastest glacier, Jakobshavn Isbræ. For this short, end-of-summer campaign, the IceBridge scientists are flying aboard an HU-25A Guardian aircraft from NASA's Langley Research Center in Hampton, Virginia. The Guardian is a version of an early-generation Falcon 20 business jet, modified for service with the US Coast Guard and later acquired by NASA. It The plane carries a laser instrument that measures changes in the ice elevation, a high-resolution camera system to image the surface, and an instrument to infer the surface temperature. Due to the Guardian's limited range, the flights will be shorter (3.5 hours long) than the 8-hour missions carried during IceBridge's spring Arctic campaign, but the team expects to fly twice a day whenever possible.